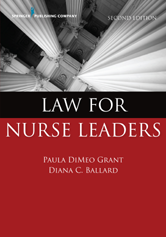 This convenient and comprehensive reference, written by expert nurse attorneys, untangles the legal dilemmas often encountered in contemporary nursing practice, such as nursing malpractice/negligence and liability, risk management, corporate compliance, employment law, business law, and dispute resolution as they relate to health care law and nursing practice. 4. The Nurse and Documentation - Ballard Diana C.
5. Patient Rights and Ethical Considerations - Ballard Diana C.
6. Risk Management - Ballard Diana C.
7. Disasters and Public Health Emergencies - Ballard Diana C.
8. Organization and Corporate Law - Ballard Diana C.
9. Corporate Compliance - Ballard Diana C.